This beautiful, fairly new 5 bedroom home is located at 5 mile point on the eastern shore of Skaneateles Lake . Enjoy 70’ of level lake frontage on the cleanest lake in the Northeast. Nestled in the heart of the Finger Lakes region, located 5 miles from the village is this newly constructed home with dockage and boat hoist for lakefront enjoyment. 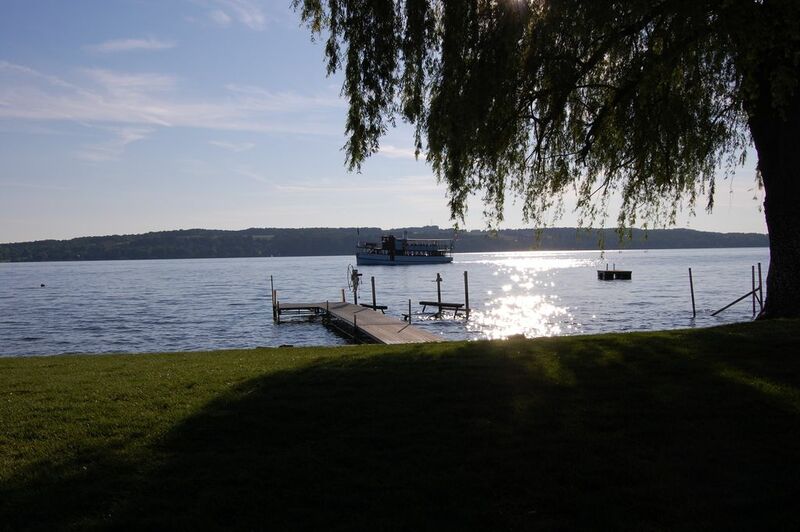 Soak up the sun, swim, boat, fish or relax on the porch, after a day visiting New York’s finest vineyards or shopping in Skaneateles’ trendy Shoppe’s. Your vacation is here! This home boasts an open floor plan, fully furnished, 5 bedrooms with 2 full and 1 half bathrooms. Inside amenities include a fully equipped kitchen with all new appliances, corian counters and cherry cabinetry. Brazilian hardwoods are throughout the lower level of the home, with an inviting 1st floor master bedroom. Custom ceramic tile in bathrooms. 2 Kayaks available for your use. 1 row boat available for your use. If interested CONCIERGE services available to you for an additional fee of $25 per hour. Services available: -Pick up and drop off from airport, train and/or bus station. -Pre-stocking or re-stocking of lake house, groceries, beverages etc. -Cooking from casual to fine dining. In home or drop off. (I must say she is the most amazing Chef) -Daily or periodic cleaning. Washing/changing of sheets towels etc. -Reservations, boat rental, restaurants, wine tours, etc. Stayed here for an extended holiday weekend and it couldn't have been better. The home itself exceeded expectations and had all modern luxuries available, even if not needed to enjoy a peaceful retreat to the lake. The host was very responsive, accommodating, and easy to coordinate with. I would highly recommend and will look to stay here on future trips to the lake. We’re beyond elated that you enjoyed your stay, and can’t wait for you to return. There’s not a better compliment. Enjoy! Beautifully maintained five-bedroom home on a gorgeous lake. It was a bit cozy in the bedrooms with seven adults and two kids, but absolutely no complaints. Kitchen is well appointed with appliances, dishes, cutlery, knives, cook ware, wine glasses for in and out, plenty of bathroom and beach towels and extra bedding in each room. It's a busy waterfront on weekends and a popular point on the lake. Sunsets are incredible. Best parts: lake clarity for swimming and kayaking and a wonderful firepit with plenty of seating! We’re elated you enjoyed your stay at Sunset Willow and visit again soon! Had a wonderful stay at Sunset Willows wouldn’t have changed a thing. Yard is larger than it appears and the rockers on the lakeside porch were a huge hit with my family. All the beds were comfortable which was great. House was immaculate and we’d recommend it highly. We’re elated that you enjoyed your stay and hope you visit again soon. We had a great week at Sunset Willow. The kitchen had everything we needed, and having a laundry room was very convenient. The house is so close to the water, and the water is so clean. The porch was great! We’re elated you enjoyed your stay and greatly appreciate the review!! This was our second year at Sunset Willow and we enjoyed it just as much as the first. The house is wonderful with great views of the lake and setting sun. We look forward to our time there next year. We’re beyond elated that you enjoyed your stay!! Sunset Willow was a wonderful lake house and exceeded our expectations. Everything was provided to make our stay very comfortable and enjoyable. Our family had so much fun with all the lake activities. We’re beyond elated that you enjoyed your stay and can’t wait for you to return! !